The Simpsons once prided itself on being one of the first shows of the “VCR era,” taking advantage of the then-recent technology with quick background jokes and humorous signage that could only be appreciated by viewers willing to wear out the “pause” button on their remote controls. As early as the second season in 1990, the show introduced a new title sequence featuring a lightning-fast “whip-pan” past a number of the show’s many supporting characters, identifiable only by going through the animation frame by frame. That level of scrutiny has only increased in the internet age, with fans now able to isolate specific Simpsons moments with pinpoint accuracy. What these scavengers have found is a veritable smorgasbord of surreal, distorted, possibly nightmare-inducing faces, with Matt Groening’s characters’ familiar visages twisted into all sorts of strange and unsettling permutations. 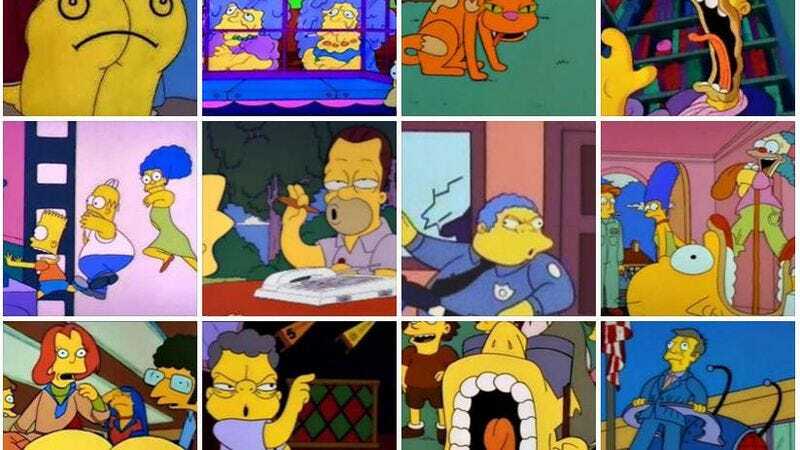 For the last few months, the best (or worst) of these hideous images have been accumulating in a mysterious yet continuously updated Facebook account called The Best Simpsons Faces. Some of the grotesqueness on display here is intentional, as the show is famously fond of nightmares, daydreams, non-canonical fantasies, skewed POV shots, and various hallucinations brought on by alcohol or other drugs. But, seemingly just as often, the characters’ faces are momentarily corrupted when they are the middle of doing something, like closing their eyes or opening their mouths. Those who thought barkeep Moe Szyslak could not become more unsavory, for instance, need only examine this particularly haunting freeze frame. And it’s clear that Principal Seymour Skinner was slowly undergoing some sort of Kafka-esque, insectoid metamorphosis on the day he brought that time capsule into school with him. And even lovable Marge and Homer, those bastions of domestic bliss, seem to be up to something unwholesome in this skeevy-looking bedroom scene. The Best Simpsons Faces posts new and upsetting images regularly and happily accepts reader submissions. The comments on each post are well worth exploring, as they sometimes reveal amazing parallels between seemingly disparate characters. And with the Fox animated series approaching the 600 episode mark, it is doubtful the forum will run out of raw material any time soon.